“It’s (Usha Halogen Oven) a very good product I’m satisfied with the overall product… I get a complete solution to cook Low Fat Precision Cooking suited for defrosting and barbecuing and is perfect for cooking all kinds of food.” – Vidya Lakshmi , Food Vlogger. About The Vlogger: Vidya Lakshmi from Bangalore, India focuses mainly on Traditional Indian and South Indian cuisine. She also reviews restaurant and products, both in English and in her native Tamil language. You can view her reviews on her YouTube Chhanel Vidyascooking. Festivals in India are a time for meeting and greeting, which invariably means a lot of guests. That in turn translates into ‘lunches’ and ‘dinners’. And there is nothing like sharing a meal of home-cooked exotic Subz Dum Biryani. Brimming with flavours, spices and assorted vegetables the Subz Dum Biryani makes for a delicious full-filling meal. Its unique flavor, aroma and taste are derived from its namesake cooking technique – ‘Dum’ meaning ‘slow cooking’. 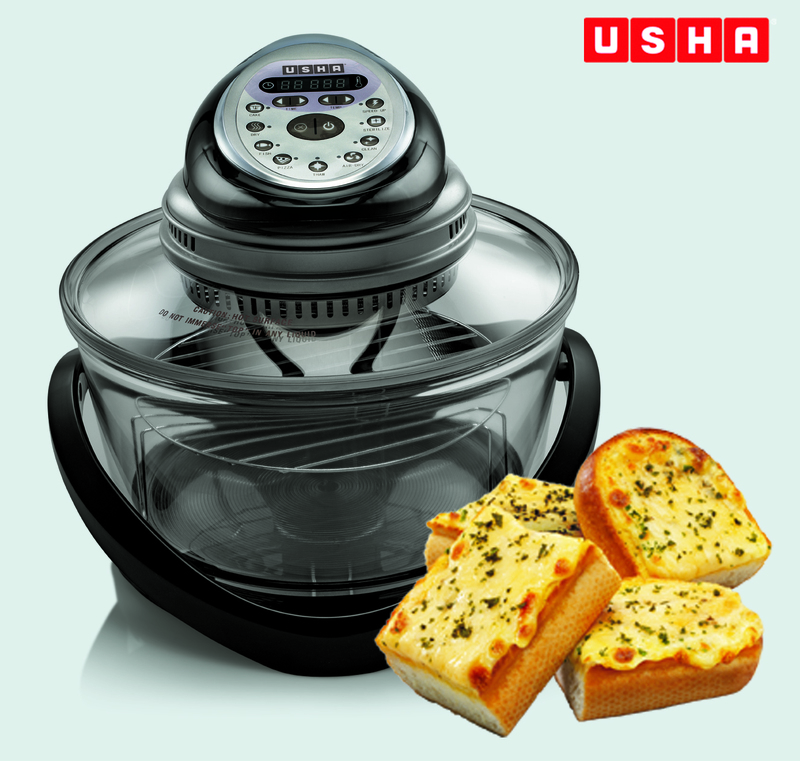 But count not the seconds, minutes and hours of toil for the technologically advanced Usha Halogen Oven will help you cook this prized recipe in a blink without compromising on its uniqueness. The right way to cook this dish is to place the ingredients inside a earthen pot and seal it tight with dough to prevent the steam from escaping, which allows the spices to give the rice an enchanting mouthwatering aroma and flavor, reminiscent of royal Mughal Kitchens. But in absence of time and in lieu of an entourage of chefs from the royal kitchen, the Usha Halogen Oven is the perfect kitchen appliance to cook it easily at home. 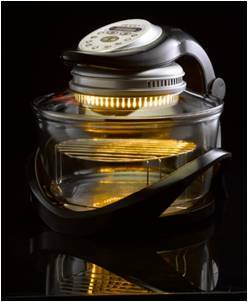 Its unique enclosed shape ensures that steam is trapped inside it, infusing the various flavours into your Briyani. While the aforementioned technological innovation doesn’t only do this fast, but does it with a simple touch of button retaining not just the aroma and falvour but also the nutrients present in the vegetables – making it the perfect Subz Dum Biryani. Wash rice several times. Strain. Let it be in the strainer for 30 minutes. (do not soak). Boil rice in 10 cups water with all ingredients till rice is a little chewy and not fully soft. Strain. Now spread rice in a big tray on a cloth. Remove whole spices from the cooked rice and discard them. Mix 1 cup cooked rice with kesar to colour the grains. Now mix this coloured rice with the white rice. Heat 2 tbsp ghee and 2 tbsp oil. Add chopped onions to the pan, stir till golden. Add half of the crushed spices. Stir for 30 seconds on low heat. Add 3 tsp ginger-garlic paste. Mix. Add red chilli powder. Add salt. Add vegetables and bhuno for 2 minutes. Cook covered on low heat till vegetables turn crisp tender. Do not overcook. Remove from fire. Let it cool down. Add the curd, stirring continuously. Mix well. To assemble the biryani, take a handi. Grease it. Spread ½ of the rice in the dish. Spread vegetables along with curd over the rice. Spread remaining rice. Sprinkle remaining crushed spices and 2 tbsp of melted ghee over the rice. Sprinkle some mint and crispy fried onions. Cover with foil. Seal foil with atta dough. Put the dish/handi on low rack in the halogen oven. Press speed up mode and set at 120°C for 20 minutes. Press start and give dum to biryani. Serve hot. Years and months of training are all put to test in just 8 minutes inside the boxing ring. The result of all your disciplined routines of exercises, practice bouts and diet plans either will see you through or rest you in peace with the knockout that you never see coming. However as the medals kept coming things got better, both her diet plans and training regime improved. Gone were the days of protein-less life. Today, she survives on light snacks before her training, followed by a healthy breakfast. Lunch around 2 and Dinner before 9 pm. And in between, she drinks a lot of juices, ending her day with a glass of milk. Morning follows with a similar diet routine coupled with her training schedule, which consists of early morning runs, followed by punching and kicking the Punching bag for an hour. And o’ course bouts of practice fighting, follow. 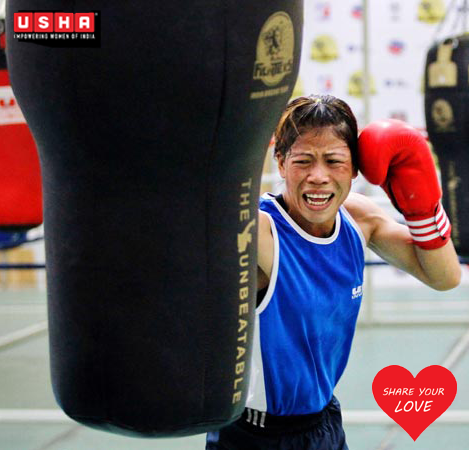 While at The HAB by Usha Mary Kom claimed that this routine helped her to lose 2 kgs a day, after her pregnancy! Impossible though that may seem to us, we all can try and live healthy lives, even with our offices, meetings and daily chores. No, you won’t lose 2 kgs a day but healthy you will stay. 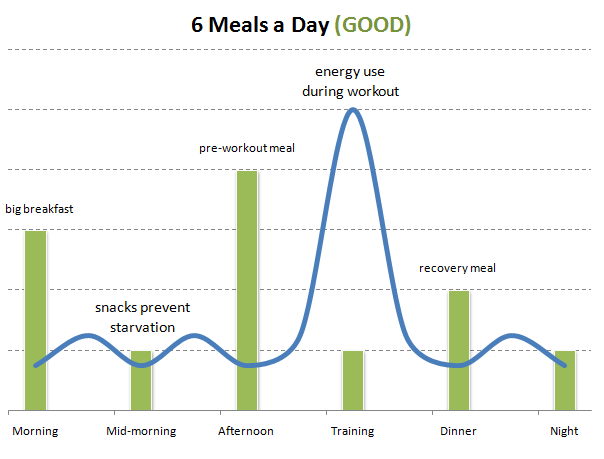 The secret dietary plan that normal boxers follow, which you could too in order to stay in shape goes something like this: To begin with skip from 3 heavy meals a day to 6 small meals a day – smaller meals keep you energized and keep your metabolism high. Workout on the above graph would translate into your daily official chores in place of rigorously punching bags or co-workers around the office! We highly recommend you refrain from the punching part. 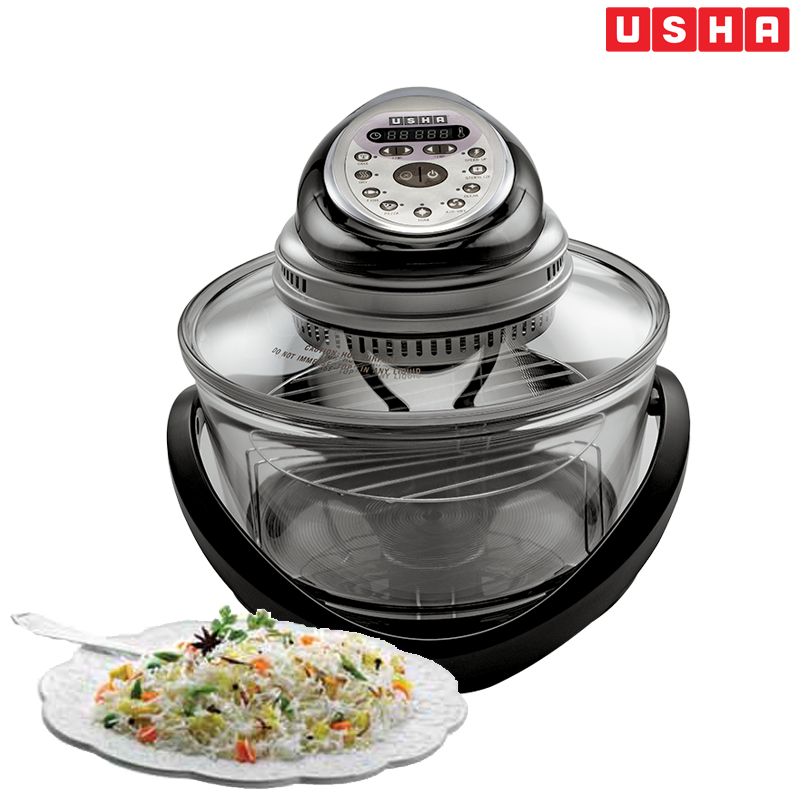 If you do have a craving for fried food, which is natural – cook them using devices that use minimum amount of oil like the USHA Halogen Oven (click for recipes). For snacks sandwiches work best and USHA has some of the best Sandwich Toasters around, pick one up for your light in-between meals – they are pretty portable too. And no diet as stated by Mary Kom, Dietitians and a zillion boxers is complete without fresh juices. 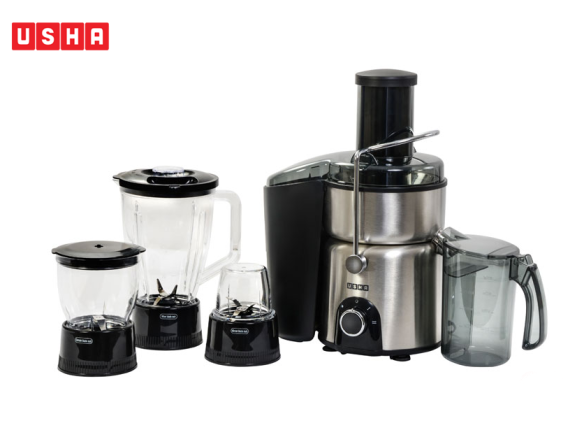 The USHA Juicer Mixer Grinder can be your best friend here. And if you are looking for what juices to drink, we have a complete Juice Therapy course for you. Click Here. The beauty of Garlic Bread is that it can be eaten with just about anything. It can be a part of a very outlandish gourmet four course meal, munched simply with a Coke and pizza or just on its own. Originating in the South of France it has not only invaded our meals and Dates but also our vocabulary – the British Comedian Peter Kay’s line, “Garlic Bread, it’s the future, I’ve tasted it” was voted the greatest one-liner in TV comedy history in 2007. The great thing about Garlic Bread is that everybody loves it from kids and adults to bums and gourmet connoisseurs. Better still you can serve it anytime, anywhere – after-school meal for kids, Evening Snacks, Supper, High Tea, Picnic and so on and so forth. Here is a simple way to make them using the Usha Halogen Oven. Cut loaf into ½’ thick slices. Put butter and all other ingredients in a bowl. Beat with an electric mixer till smooth. Place bread slices on the high rack in the oven. Press the pizza button and set time to 3 minutes. Let temp be 210°C. Press start and bake for 3 minutes. Take out the baked bread from the oven and spread cheese mixture on the untoasted side of the bread. Put bread back in the oven and again bake on pizza mode (210°C) for 3 minutes or till golden. A quick snack or a Gourmet side dish, the choice is yours. Like you, we too get dumbfounded by the price of Brownies at the chic coffee outlets. The outlets, we must admit are nice and decent, but still that doesn’t give them an excuse to charge astronomical sums for a single brownie. It is just not fair, especially if you have kids who are madly and deeply in love with Fudge Brownies. And who knows how healthy these ‘brownies for sale’ are. 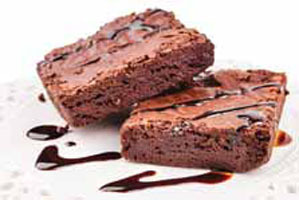 Besides being healthy the warm smell of fresh home baked Brownies is a delight in itself. It’s time to wow your kids and friends with your Fudge Brownies over a cup of coffee or a glass of milk. Melt butter in a deep pan on low heat. Add brown sugar. Mix well with a wooden spoon on very low heat for about 5 minutes till well blended. Remove from fire and cool completely. Add one egg. Mix well with a wooden spoon. Add the second egg and mix again. Add essence. Sift flour, baking powder and cocoa together. Keeping aside ¼ cup walnuts, add the rest of the walnuts to the maida and mix well with the hands. Mix the flour mixture in the butter-egg mixture very gently with a spoon. Line and grease a loaf tin. Transfer the cake mixture in it to get 1″ thick layer of the mixture. Sprinkle the remaining walnuts. Place on the low rack in the Halogen oven. Press speed up mode and set for 40 minutes at 140°C. Press start to bake. When the beep comes remove from oven. Check with a tooth pick. Leave to cool for 5-10 minutes in the tin. Remove from tin. Cut into squares to serve. Baking them in the Usha Halogen Oven makes the whole process real easy. Besides unlike your normal oven it can be used for various other purposes to cook up recipes ranging from regional dishes to global favorites. There is nothing French about French Fries! To begin with they originate in Belgium and are simply called French Fries because they happen to be deeply fried. During the good old days everything deep fried was supposedly French fried! And therein lies the rub: the word ‘fried’ has a billion unhealthy connotations tied to it. Did you know that the name KFC, was officially adopted in 1991 from Kentucky Fried Chicken, as people got more health conscious? And no company wanted the word ‘fried’ anywhere near their finger licking dishes. Just 1 teaspoon of Oil!! In a mixing bowl add frozen French fries, and just a single teaspoon of oil and mix well. Select speed up on Halogen Oven panel for 4 minutes at 230 degree C. You could add an extra minute to brown them further. Wait with mouthwatering anticipation! Eat healthy without an ounce of guilt. School’s out for summer and your kids are home running around helter-skelter doing what these agents of chaos do best. The only respite you have is when they finally settle down in front of the Television to catch a glimpse of their favorite toon or action hero. Only to be tricked by those clever commercials featuring treasures of sweets and then they are at it again, now demanding that they be taken out for a treat. It is 40 C outside and there is no way in hell you are ready to step out, let alone take a 10 mile ride to the nearest Baskin Robbins or Mc Donald’s. Life is hard! But help is at hand: this delicious Vanilla Cherry Cake recipe is meant for times like these, easy to make and awesome to taste, it is going to be your savior this summer. 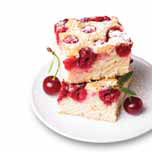 For those using the Usha Halogen Oven life gets even simpler, all you need to do is press Cake Mode, stand back and relax, to return 40 mins later to a beautiful Vanilla Cherry Cake. And it is not just Cakes you can make with this Kitchen Appliance there is a lot you can cook from Pizzas and French Fries to Pies and Pasta – in fact everything that your kid will ever demand this summer. In all earnest the Halogen Oven can be aptly re-named as the Kid’s Food Factory! ½ tin condensed milk (milk-maid), ½ cup milk, approx. Grease and dust a round cake tin of 8” diameter. Sift maida with cornflour, soda-bicarb and baking powder. Keep aside. Mix sugar and butter. Beat till very fluffy. Add milk-maid. Beat well. Add 3-4 tbsp maida and mix. Add half the milk. Beat well. Add essence. Add the remaining maida and the milk beating well after the addition. Beat well for 3-4 minutes till the mixture is smooth and light. Mix cherries with 1 tsp maida to coat dry fruits. Add half of the cherries to the batter and mix well. Pour the batter in a greased and lined tin. Sprinkle the left over cherries on the cake to cover it well. Put the cake tin on the low rack in the oven. Press cake mode. Set the temperature to 150°C and time to 40 minutes and press start to bake. When the beep comes, check with a tooth pick. It is ready to be served to bring down the temperature a lot of notches lower, in more than one sense.